The V.I. Department of Public Works (DPW) informs the motoring public of an upcoming road closure. 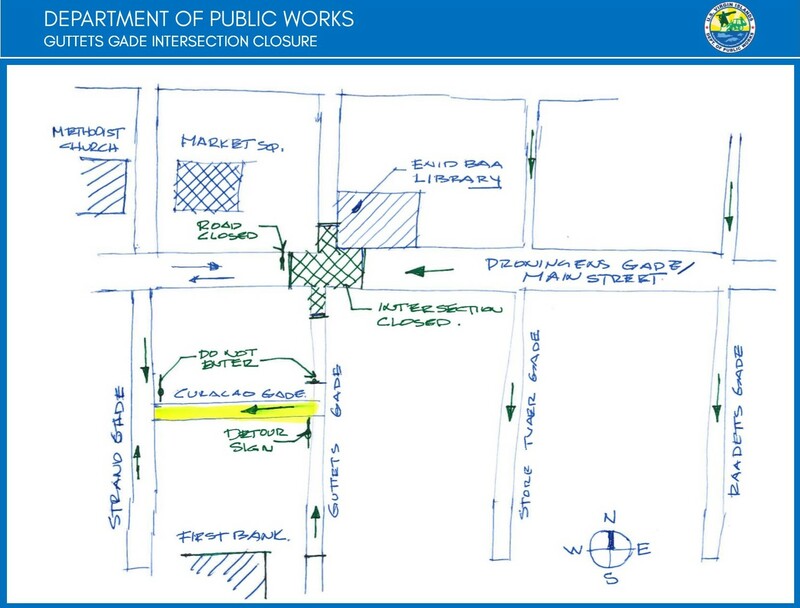 To accommodate the steady progress that contractors continue to make on the Main Street Enhancement Project, the intersection at Guttets Gade will be closed starting Friday, Aug. 17, until further notice. This closure will allow for the excavation of the road as well as the installation of conduits and the new Euro Cobble Pavers that will connect to the existing pavers along Market Square. · All vehicular traffic will be allowed to travel north onto Guttets Gade, but it must then detour to head west on Curacao Gade. · Traffic on Curacao Gade will now flow towards the west and exit onto Strand Gade. · Motorists will not be permitted to enter Curacao Gade from Strand Gade. Traffic signs will be posted to assist the motoring public of the changes. See the attached map for further clarification. DPW will continue to keep the community updated as this project progresses. The community’s patience is greatly appreciated as the department works to improve road conditions throughout the territory. 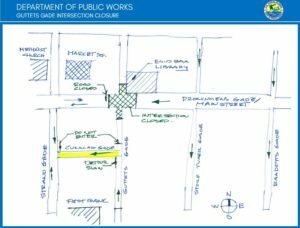 For more information on the Main Street Enhancement Project, call the St. Thomas office at 776-4844 or follow DPW on Facebook @usvidpw to stay abreast of all things V.I. Public Works.